View every player currently on the San Francisco 49ers 2017 90-man roster. The San Francisco 49ers announced on Monday they have signed DL Leger Douzable (LEE-jay DOO-zub-ul) and OL Andrew Gardner *to one-year deals. In order to make room on the roster, the team has waived/injured S *Chanceller James. If James is not claimed, he will revert back to the teams Injured Reserve List. Douzable (6-4, 284) originally entered the NFL after signing with the Minnesota Vikings practice squad as an undrafted free agent on September 3, 2008. He spent the 2008 season on the practice squad of both the Vikings and New York Giants. Over the past eight years (2009-16), he has spent time with the St. Louis Rams (2009), Jacksonville Jaguars (2010-11), Tennessee Titans (2012), New York Jets (2013-15) and Buffalo Bills (2016). Douzable has appeared in 107 games (14 starts) and registered 159 tackles, 6.5 sacks, two passes defensed and one fumble recovery. Last season in Buffalo, he appeared in all 16 games (five starts) and finished with 43 tackles, 1.5 sacks and one pass defensed. A 31-year-old native of Tampa, FL, Douzable attended the University of Central Florida where he appeared in 49 games (24 starts). As a senior in 2007, he earned First-Team All-Conference USA honors after starting all 14 games and leading the team with 7.5 sacks. 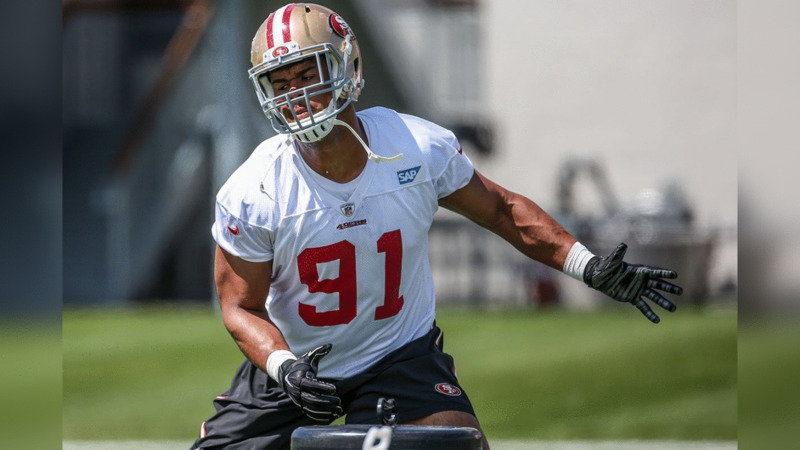 Gardner (6-6, 308) rejoins the 49ers after signing with the team on December 21, 2016. He started at left guard in the team’s final game of the 2016 regular season. He has appeared in 28 games (12 starts) with the Miami Dolphins (2009-10), Baltimore Ravens (2010), Minnesota Vikings (2010), Cincinnati Bengals (2010-11), Houston Texans (2011-13), Philadelphia Eagles (2014-15) and 49ers. A 31-year-old native of Tyrone, GA, Gardner attended Georgia Tech where he started in each of his 48 appearances for the Yellow Jackets (2005-08) and earned First-Team All-ACC honors as a junior and senior. James (6-2, 208) originally signed with the team as an undrafted rookie free agent on May 8, 2017. He attended Boise State University where he appeared in 35 games (24 starts) and registered 171 tackles, 10.5 tackles for loss, four interceptions, 3.0 sacks, seven passes defensed and one fumble recovery.